Founded as a spiritual retreat in 1962, Esalen, is an intentional community, educational institute and retreat center that focuses on humanistic and alternative education through activities such as meditation, massage, yoga, psychology, ecology, and spirituality. The 27-acre Institute is built around a set of mineral hot springs on Big Sur’s dramatic and beautiful coastline with its rugged cliffs and cozy coves. Esalen offers comfortable accommodations, home-cooked cuisine, mineral hot springs, a small farm, garden, and an art center. Located near Lime Creek and the John Little State Natural Reserve, 45 miles south of Monterey, Esalen presents hundreds of workshops every year, as well as residential work-study programs, conferences, internships and research initiatives. The hot springs are only accessible to guests of the resort during the day. Named after the native tribe that used to inhabit the area, Esalen features native historical sites near the Slate Hot Springs and the creek canyon which can be explored. While the rugged rocky shoreline only offers rock pools and crashing waves, Pfeiffer Beach is 15 miles to the north and Limekiln State Park is 11 miles to the south. 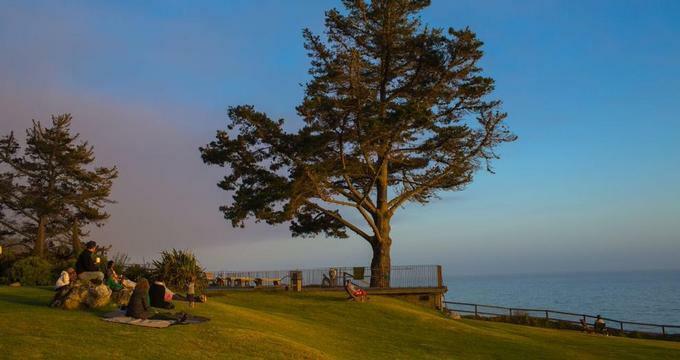 The Esalen Institute offers a variety of accommodations for guests staying at the resort to attend the institute’s many workshops on holistic medicine, Eastern religion, yoga or meditation, ranging from standard and premium rooms to point houses and hostel-style bedding. Shared housing features standard guest rooms which sleep two or three people, some with private bathrooms and some with shared bathrooms. Premium rooms offer greater levels of privacy and feature upgraded bathrooms with showers and/or outdoor ball and claw bathtubs, underfloor heating, climate insulation and enhanced sound. Premium rooms with ocean views and landline Internet can be requested. Nestled behind the Esalen Garden Point on a cliff’s edge, Point Houses are private suites with beautiful views of the Pacific Ocean. Three Point Houses offer spacious living rooms with wood-burning stoves, a fully equipped kitchen and dining room, and a master bedroom with an en-suite bathroom. A private redwood deck looks out over the ocean and has an outdoor claw foot tub. Point Houses have telephones and Internet connections. Hostel-style Bunk Bed Rooms are available for guests who don’t mind sharing a room with four to six other people, and there are limited shared sleeping bag spaces for guests with limited financial means. Shared sleeping bag space involves bringing your own sleeping pads, sleeping bags, blankets, and pillows and sleeping in a meeting room that has been designated for sleeping. The Lodge features a fully equipped kitchen, spacious dining room, sun room and outdoor deck where guests can relax and socialize over a drink or meal. Run by an expert culinary team, the Esalen kitchen serves delicious, healthy meals to all the guests at the resort every day. Catering for up to 350 people per day, the kitchen serves delicious home cooked meals for breakfast, lunch and dinner using fresh, locally sourced ingredients from local farms and herbs and salads from the Esalen garden. The food served at Esalen highlights the institute’s commitment to sustainable practices and its profound bond with the surrounding land. Lovingly grown and harvested by the institute’s garden staff, fresh produce, such as heirloom root crops, a variety of kale and lettuces, and specialty herbs are used for making gourmet salads and specialty teas. Fresh fish is hand caught in Monterey Bay and eggs are sourced from the locally based organic and cage-free Glaum Egg Ranch. All dishes are made with all-natural and organic meats and hormone-free dairy products, with vegetarian, vegan, dairy-free and wheat-free options at every meal. Breakfasts include organic hot cereals, local, cage-free eggs, house-made granola and yogurt, local, organic fruit, house-baked bread and natural preserves, and garden-grown greens. Lunches and dinners feature a selection of homemade soups, an extensive organic salad bar, and a variety of creative, wholesome entrees. Snacks and beverages are available throughout the day, including homemade bread, nut butter, preserves, fresh fruit, tea, and coffee. Esalen Hot Springs are located on the cliff side and have been used for ritual healing for more than 6,000 years. The upper level of the Springs features an outdoor massage deck and “living” roof of native coastal grasses, as well as a hot tub with handicap access lift and a wheelchair-accessible changing room and bathroom and shower. The lower level of the baths has two changing rooms with glass-encased shower rooms overlooking the ocean, several indoor and outdoor tubs of varying degrees of heat, as well as private, claw foot tubs. There are also massage rooms on the upper level and towels are provided. Esalen offers a unique Movement and Meditation Program, which is run every week and available for guests free of charge. A variety of classes is offered, ranging from contemporary, free-form, improvisational and spiritual dancing, Tai Ji, Gestalt Movement, Qi Gong, and NIA, as well as Hatha Yoga, Restorative Yoga, Yin Yoga, Yoga Nidra, and Vinyasa Flow Yoga. There are also Meditation classes, including Didgeridoo Meditation and Sensory Awareness Chakra Meditation and singing classes. Other programs include a 12 Step Tribe, writing groups, and Somatic Awareness. Guests can indulge in a pampering massage treatment with an Esalen Massage. Renowned for helping to release stresses in the body through long flowing strokes, Esalen Massage are delivered by trained Esalen practitioners who accommodate specific requests through the Esalen massage modality. Located next to the lodge in the center of the property, the Esalen Bookstore is a cozy bookstore spanning 600-square-feet that sells a variety of books, magazines, journals, prints, postcards, gifts, music, clothing and ceramics. Commonly known as the Art Barn, the Art Center is located on the cliffs next to the Leonard Pavilion and the Farm and serves as a residence for artists and a base for creative workshops, including painting, drawing, textile arts, metalworking, stone carving and wood turning. The Art Barn has also used an open studio space for workshops and other events, with a range of arts and crafts materials and supplies available. One of Esalen Institute’s primary philosophies is a strong commitment to sustainability and operates an eco-program called The Living Machine, which offers the perfect solution for integrating a functional ecosystem into the site by upgrading its wastewater facilities while conserving resources and protecting natural water cycles. The Living Machine processes the wastewater from the lodging and laundry facilities and uses it to recharge the local aquifer and irrigate the landscape. The Living Machine achieves its goal of sustainability by using just a quarter of the energy of comparable water treatment systems, serving as a home for local fauna and flora and enhancing the surrounding landscapes. The Esalen Farm and Garden have been growing organic food to sustain, educate and heal the community for more than 40 years. The farm utilizes traditional modes of farming, including organic, bio-intensive, biodynamic, and permacultural, and provides fresh produce that is used in the kitchen for creating delicious meals for breakfast, lunch and dinner. Esalen Institute is located along the stunning coastline of Big Sur, a rugged 90-mile stretch of California’s central coast that lies between Carmel and San Simeon. 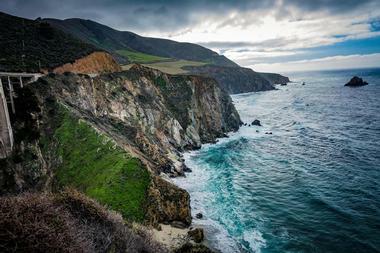 Bordered by the majestic Santa Lucia Mountains to the east and the indigo Pacific Ocean to the west, the Big Sur is world-renowned for its dramatic seaside cliffs, cascading waterfalls, crashing ocean waves, misty beaches, and pristine state parks. 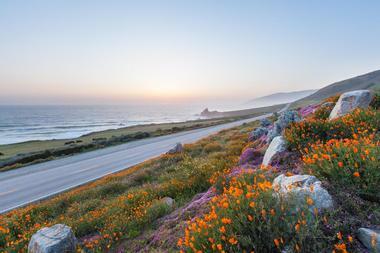 Pacific Coast Highway winds its way along the coastline of Big Sur, creating some of the world’s most beautiful ocean vistas, which inspired famous authors such as Henry Miller and Jack Kerouac. Fog-banked canyons and rolling green meadows form part of several redwood-filled state parks, which offer world-class hiking, mountain biking, rock climbing and camping while the coastline offers world-class surfing, whale-watching, wildlife and bird watching and beachcombing. A six-mile strip along the coast is home to a plethora of restaurants, boutique stores and art galleries and interesting things to see, including the Point Sur Lighthouse, a National Historic Landmark five miles north of Big Sur Village, and the iconic Bixby Bridge built in 1933. Other exciting attractions include the 80-foot-high McWay Falls, which drop into the ocean and the beautiful New Camaldoli Hermitage monastery. 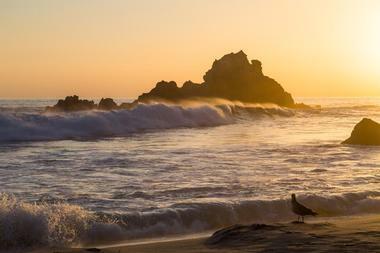 Big Sur offers a wealth of outdoor recreational activities from hiking and mountain biking to surfing and sightseeing. There over 80 hiking trails, varying in length, difficulty and natural scenery from the beaches through to the redwood forests of the Santa Lucia Mountains and several pristine and remote beaches, including Pfeiffer Beach, Andrew Molera State Park and Sand Dollar Beach. The green beaches south of Big Sur Village are filled with semi-precious stones of jade, while the Point Lobos State Reserve presents excellent hiking, beautiful beaches, secluded coves and rugged points.